Terra, shining jewel of the United Empire of Earth! Terra III, commonly referred to by its star’s name, has made great strides towards becoming the cultural focus of the Empire. While die-hard Earth loyalists would dispute such a claim, there is no doubt that Terra has its finger on the pulse of the civilized galaxy. From the increasing inflow of megacorporate HQs to the system to the influence of Terranoriginated music on popular culture, Terra is unquestionably the closest thing to a rival Earth has ever produced. The Terra system, then designated 342A, was first charted in 2508 and explored as part of a five-system “long run” research expedition in 2516. When the first long-distance magnetic relay images of the system’s third planet resolved, the explorer crew immediately knew they had hit it big. A natural superearth located squarely in the star’s green band, Terra III was immediately recognizable for it’s astounding similarity to an untouched Earth. Lush, verdant and brimming with natural resources, Terra’s colonization was immediately obvious. Within two years no fewer than seven colonial sloships had been dispatched to the world. Astrophysicists soon staked their own claim with a startling discovery: Terra system’s unique location and makeup meant that it was a strong jump point hub. Like Sol, Terra is a G-type main sequence star. Unlike Sol, its outer planetary system never formed. Without the mass diffusion caused by gas giants and with the star’s location in the center of a dense stellar cluster, extremely stable jump points arose easily. Thus far, five jump points have been charted and scientists believe that a sixth is almost a certainty. (Theoretically, as many as twenty-four could exist, although the odds against most of them ever being stable enough for transit are astronomical.) Exobiologists, too, had an early interest in the system: massive stone ruins clearly indicative of intelligent life were discovered on Terra III’s southern continental mass. No other evidence of this ancient civilization has yet been uncovered on the planet, creating one of the most-debated archaeological mysteries of our time. Terra III was the twelfth planet colonized by the United Empire of Earth. In four centuries, owing to its jump network and location, it has evolved into a massive trade hub. Kiel, Baker, Kilian and other name systems are short hops from the star. The world’s plentiful resources, cultivated carefully so as not to impact the environment, have fueled the Empire’s Eastern Expansion Program. A non-descript rock world incredibly close to its star. Although rich in certain minerals, attempts to harness resources on Aero have been largely unsuccessful due to its proximity to the sun. Even the harshest environment suits are incapable of sustaining Human life long enough to conduct factory maintenance on a world with a 95 Standard Earth Day orbital period. The mining efforts on Pike, on the other hand, are a masterpiece of Human engineering. One of the most mineralrich planets in the galaxy, Pike is dotted with thousands of unmanned “cities” churning out tons of platinum, mercury, iron and gold every day. With three times the orbital period of Aero, Pike is still incapable of sustaining Human life for an extended duration. Regardless, the lack of atmospheric storms and other weather events means that fully mobile robot machinery can operate with peak efficiency and requires very little downtime. The mines and refineries of Pike have been essential to fueling Terra’s expansion and to allowing Terra itself to remain relatively untouched. 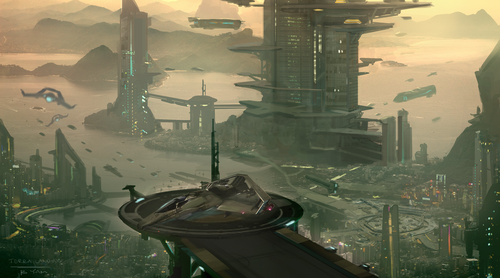 The capital city of Terra is Prime, a beautiful bayside megacity built on the foundations of two of the original colony ships. A stark contrast to Earth’s metropolises, everything in Prime was planned by the original settlers, leading to a much greater balance between nature and civilization than is found elsewhere in the Empire. Unlike many cities, Prime’s primary landing zone is located away from the city to reduce pollution and air congestion. A monorail runs pilots to and from their hangars. Don’t let the relaxed atmosphere fool you, though: Prime has everything New York or Moscow does, from ship upgrade stores to black market opportunities. The city itself divides into two major regions: the sparkling Downtown and the lower class residential region known as The Block. Opportunities for visitors are available in both portions of the city. Terra’s second-largest city is Quasi, in the colder southern hemisphere. Quasi is built into the shadow of the massive ruins discovered early in Terra’s exploration. Quasi is considered more of a tourist destination than Prime, although several corporations operate in the region. Crusader Industries, best known for its facilities in Stanton sysem, operates the Platinum Bay landing facilities. New Austin, another initial colonization point, is as close as Terra comes to an industrial city. New Austin is a business park writ large, home to corporations like ORIGIN Jumpworks and Cronus Devices. The cost of living in New Austin is lower, leading to more of a “blue collar” sensibility, but moneyed compared to other worlds. The centerpiece of the city is The Old Hall, a former Miner’s Guild meeting area now populated by factory owners, pilots, haulers and shippers. Oft overlooked is the fact that Terra’s sister world, Gen, is also an inhabited world. This smaller planetoid, the outermost in the system, was terraformed roughly a century after Terra’s initial settlement and is now home to the diplomatic and military aspects of the system’s government. Consisting largely of military bases, Imperial administration and housing, the world represents a conscious effort on the part of the Terran system planners to separate business and pleasure. There is an ongoing debate about Gen’s representation in the Senate. Though the planet is well-populated, the inhabitants are almost exclusively government workers. Thus far, Earth has shut down any attempts to award them representation, seeing it as a thinly veiled plot to extend Terra’s influence.